This Thanksgiving, eat local by celebrating the bounties of some of our province’s most versatile ingredients – organic bread and all-natural turkey. A Bread Affair and JD Farms have partnered up to provide customers and fans alike with a special stuffing recipe using A Bread Affair’s Apricot and Walnut loaf that will satiate the many different palates at the dinner table on Monday, October 14, 2013. 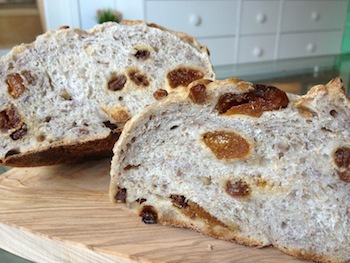 A Bread Affair’s Apricot and Walnut loaf contains organic unbleached white flour, filtered mountain lake water, organic malt, sea salt, organic whole apricots, walnuts, and raisins. No added sugars or oils ensure that the true flavour of the ingredients shine through. Cut bread into ½ inch pieces. In a 4 quart pot, melt butter on low heat. Add in diced onions, leeks, celery, and sauté until tender, stirring constantly. Add in minced garlic, parsley, JD turkey stock, salt, pepper, and poultry spice. Mix together, stirring for 5 minutes then add to bread and mix well. Transfer to a baking dish, cover with foil, and bake at 200 degrees C for about 30 minutes. Uncover and bake until top is browned, about 10 to 15 minutes more. A Bread Affair was conceived by a passion for great bread. Tanya Belanger, master baker, wanted to create bread with honest ingredients and phenomenal flavour. Studying under 4th generation master American baker Keith Guisto, Belanger worked to perfect her craft in the SanFrancisco area of California. In 2006, with the approval of her mentor, she opened up her own bakery in the heart of Langley with the intent to create the best bread you will ever have. Jack and Debbie Froese are the owners and founders of JD Farms Specialty Turkey, a family-run producer of specialty turkeys located in the beautiful Fraser Valley at Langley, BC, Canada. Jack and Debbie grew up on farms in the Fraser Valley and continued their farming tradition with the purchase of their present farm in 1979. For over thirty years, JD Farms Specialty Turkey has been offering a diverse range of nutritious and wholesome meal solutions in the traditional country-style deli and bistro, as well as supplying whole turkeys to families and retailers in the Metro Vancouver and Fraser Valley regions. For more information, visit www.jdfarms.com.